One-year subscription to the online courses. This pack includes everything that a manager needs to implement the fundamentals of a Workplace Accountability/Just Culture within his/her department. 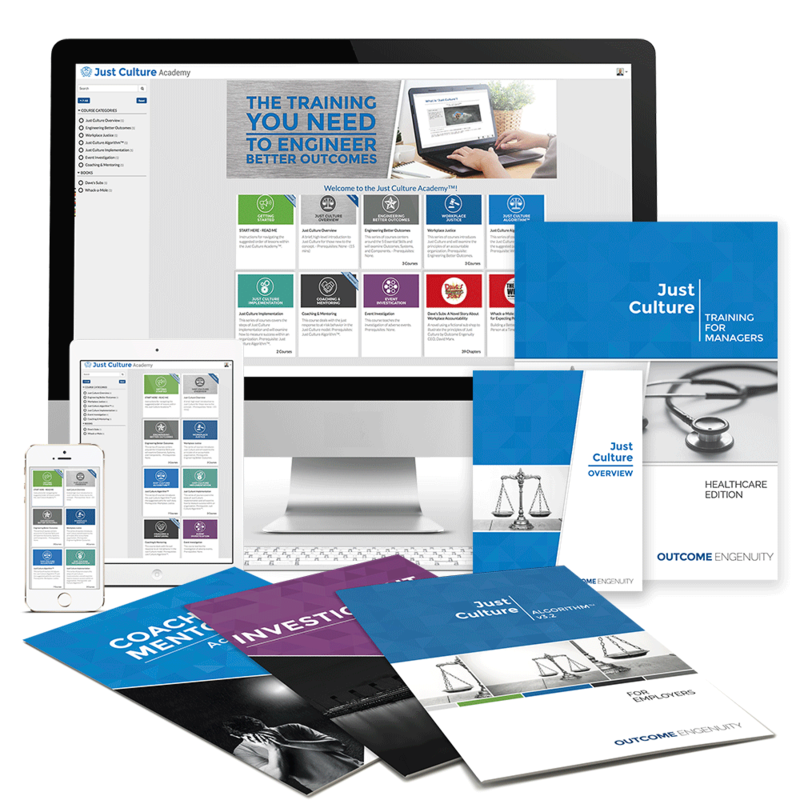 The Just Culture Academy™ online training and accompanying print tools. This is the complete manager package. Course 1 is the Workplace Accountability/Just Culture Managers Training. This online course and workbook combination introduces managers to the principles of the Just Culture. This training guide covers the Three Duties of employees, the Three Manageable Behaviors, event investigation, systems design, and the use of the Just Culture Algorithm™ as a key decision making tool. Managers will be educated in concepts which create a safety-supportive culture, supporting an open reporting environment while holding employees accountable for their choices. Course 2 is the Event investigation Training. This 1½-hour online training product outlines the Five Rules of Causation followed by the steps necessary to conduct an effective investigation. This course will walk you through the initial identification of the undesired outcome to eliminating possible biases and developing risk reduction strategies. Course 3 is the Coaching and Mentoring Training. This one-hour online course focuses on the skills necessary to coach and mentor in a Just Culture organization. Within a Just Culture, effective coaching and mentoring are principal tools in managing at-risk behavior.